We believe in the power of collaborative working. The more ideas that are considered, the more people whose voice is heard — the better the outcome. That’s why every job we undertake has its own ‘Working Wall’. 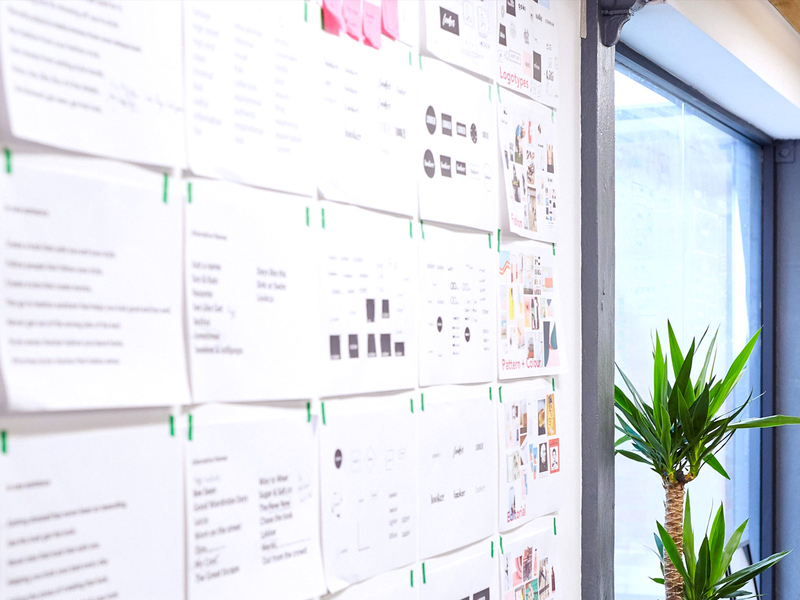 This is a space where ideas and inspiration can be pinned up, where every member of the team can contribute to the development of a job, and where the story of each project is told. 1. Spotting the big idea. Once something is on the wall it becomes a subject for discussion and a potential source of inspiration. The smallest ideas can often turn out to be the most fruitful, but without the wall they might be missed. One person’s dead end is another’s eureka moment. 2. An open invitation. Huddling around screens turns teams into isolated, atomised units. Standing around a project wall invites collaboration and exploration, and draws more people, including the client, into the process. 3. Cultivating creativity. Everyone has a creative side, and a wall full of ideas, inspiration and talking points helps to bring it out. The wall takes people away from their usual working environment and encourages involvement and participation. It’s a place where creativity, and decisions happen. 4. The whole story. Our wall shows clients the journey we have been on, and lets us explain ideas and concepts from the very earliest stages onwards. It also gives everyone the chance to step back and take in the big picture; giving us a good idea of the scale of the job and informing smart, and potentially time-saving, decisions. 5. A good sign. Let’s face it, empty walls are sad! A busy working wall is a sign of a studio bursting with ideas. 6. It’s digital too. As a digital agency, it’s imperative that our walls work in the digital world; so we have the tools to extend access to people who aren’t in the room. Working walls prove their worth in every job we do, and were particularly central to the success of projects for Mamas & Papas and Code Computerlove. They keep our clients involved at every step of the process, and give everyone the chance to discuss, interrogate and develop ideas. The wall is where debate lets us to create!